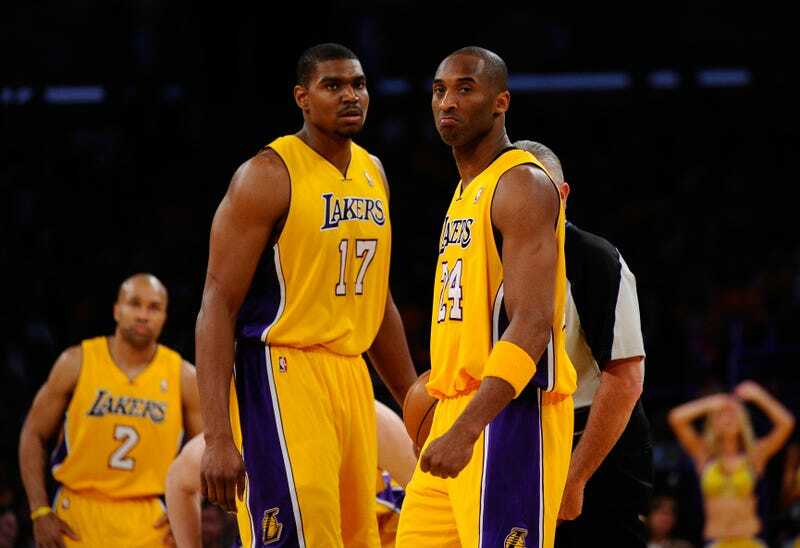 Andrew Bynum On Kobe: "You're Always Having Issues With Him If You're Playing Poorly"
Every morning, the fine folks at Sports Radio Interviews sift through the a.m. drive-time chatter to bring you the best interviews with coaches, players, and personalities across the sports landscape. Today: Everyone's scared of angry Kobe. Andrew Bynum joined ESPN Radio in Los Angeles with Max and Marcellus to talk about the relationship between him and Kobe Bryant, what the relationship between the two guys used to be, how tough it has been to fight through all the injuries of the past, on Mike Brown demanding defense and effort for 48 minutes, on his name usually being linked in trade rumors, and where he thinks the Lakers are heading to finish this season. "Yeah man we definitely have a much better relationship than in the past. Obviously on the court the trust is there and he has been telling me a few things, little footwork tricks and stuff like they can't stop me, giving me confidence. I've been working a lot with guys like him on my footwork and just going to work. Just going out there playing and having fun that's the biggest part." "The guy wants to win so you always have issues with him if you're playing poorly or subpar. Other than that I think I'm a guy who can help this team win when I go out and play dominant and not have much of an issue." "Coming back from injury, it always happened when I was playing well. It was a little step back and really you have to be dedicated to wanting to get it back, going through pain, through swelling, and it is what it is as far as my knee goes. I feel healthy, I feel very, very good, and rehab-wise just being dedicated to going in every day and doing something to kind of help it, whether it be lifting weights or be working on footwork, just making sure that you're doing your due diligence as far as taking care of your body." "It's something that he has been trying to get me to do all season is be out there playing hard, not taking plays off, get a rebound, get a blocked shot, or do something to impact the game each play. He's been leaving me on the court to accomplish it which is big. The first time I've ever played 35 plus minutes per game and really just learning as the game slows down for me." "I definitely feel like I'm going to be a Laker for a long period of time. They had an opportunity to trade me earlier and didn't do it. They wanted me to develop and that's what I'm realizing now and trying to go get. Trade rumors don't really affect me. I've been in every one that has come up so far and the Lakers always hold on to me. For that I give the gratitude and I'm going out there showing on the court that they made the right decision." "This team is definitely trying to head to that number two or number one spot. We can definitely catch up to San Antonio, we play them three times, and we have played them yet so each and every game that we play against them is going to be huge and we're looking forward to that. I think our focus is there and we understand where we are offensively and then defensively it's about playing hard so that's just it." • Vincent Jackson says he's "close enough" to South Beach. • Jay Cutler is going to keep an eye on Brandon Marshall. • Calvin Johnson says he's not a diva.